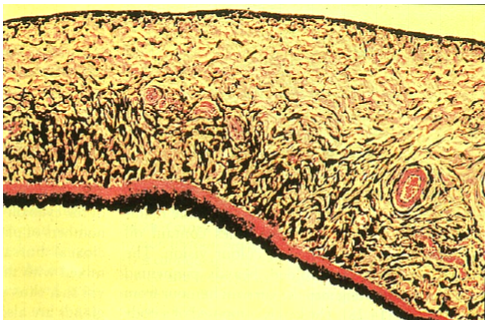 Figure 1: Tapetum fibrosum of the canine eye. 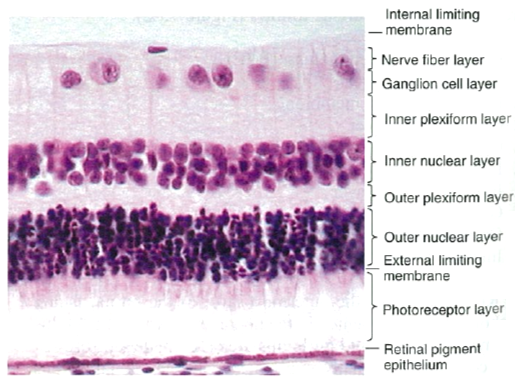 1: Sclera composed of white dense fibrous tissue 2: Lamina fusca 3: Choroid with capillaries 4: Tapetum cellulosum 5: Photosensitive layers of the retinal layers 6: Pigment layer 7: Rods and cones 8: Nuclei of rods and cones 9: Outer synaptic layer 10: Bipolar nerve cell nuclei 11: Inner synaptic layer 12: Optic nerve cells 13: Optic nerve fibres. 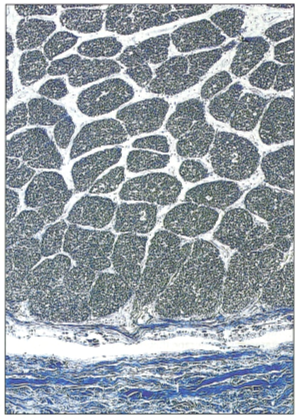 H&E x160 Source: Aughey E. and Frye E.L. (2001) Comparative veterinary histology, 1st edn., London: Manson Publishing Ltd. 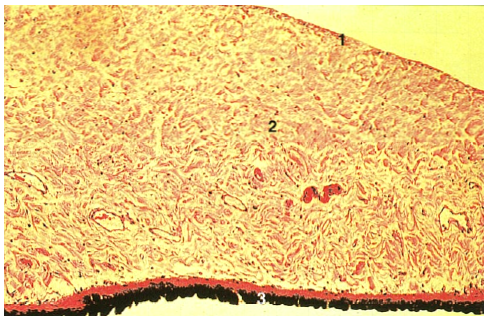 Source: Aughey E. and Frye E.L. (2001) Comparative veterinary histology, 1st edn., London: Manson Publishing Ltd. 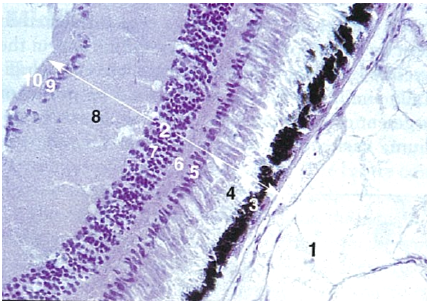 Figure 7: Canine iris. Pigment in this picture is different from the pigment in figure 6. 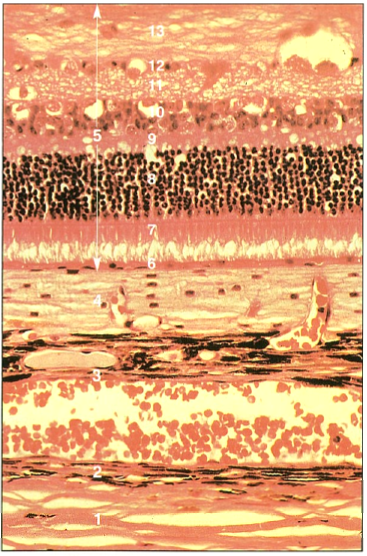 Figure 9: Layers of the retina. Source: Gartner L.P. and Hiatt J.L. (2009) Color atlas of histology, 5th edn., Philadelphia: Lippincott William & Wilkins. 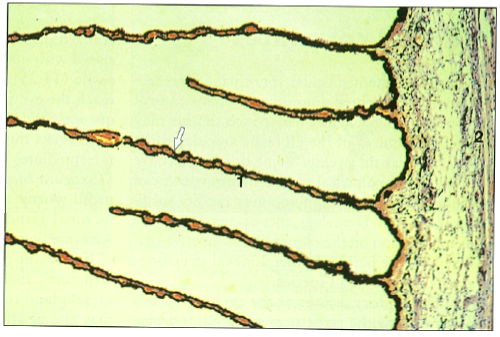 Figure 11: Optic nerve. S: Sclera ON: Optic nerve U: Uveal tract D: Dura mater P: Pia-arachnoid A: central artery of retina. Source: Young B. and Deaken P.J. 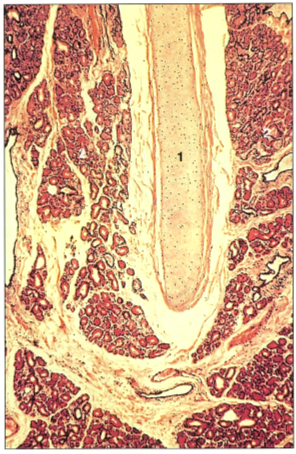 (2002) Wheater's functional histology: A text and colour atlas, 5th edn., Edinburgh: Churchill Livingstone Elsevier . 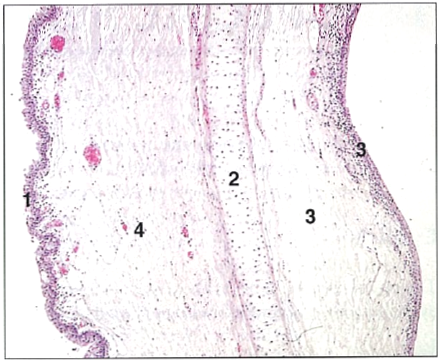 Figure 12: Lacrimal gland separated into lobes and lobules (LO) by connective tissue (CO). 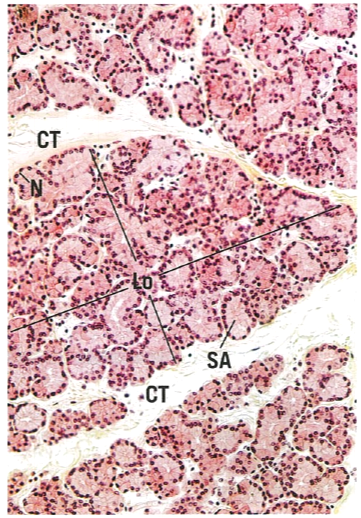 SA: serous acini N: nuclei. x132 Source: Gartner L.P. and Hiatt J.L. 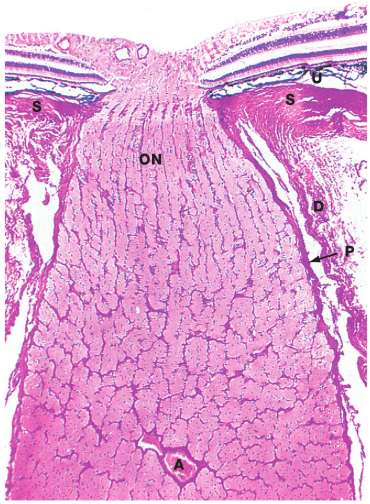 (2009) Color atlas of histology, 5th edn., Philadelphia: Lippincott William & Wilkins. Figure 13: Avian eye. 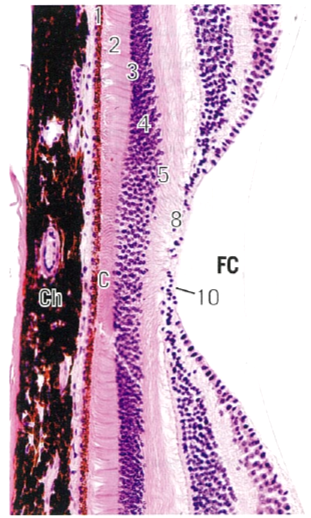 1: Sclera with hyaline cartilage. 2: Choroid. H. & E. x62.5. Figure 16: Eyelid of a horse. 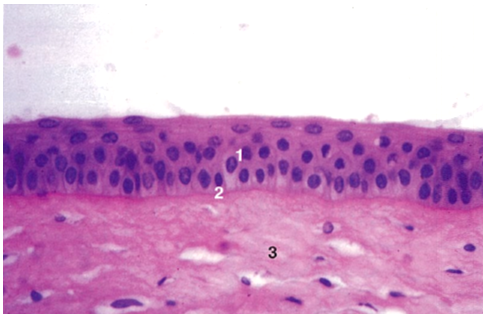 1: Stratified columnar epithelium with mucus secreting cells of conjunctiva 2: Sebaceous glands in the lamina propria 3: Tarsal plate. H&E. x25. 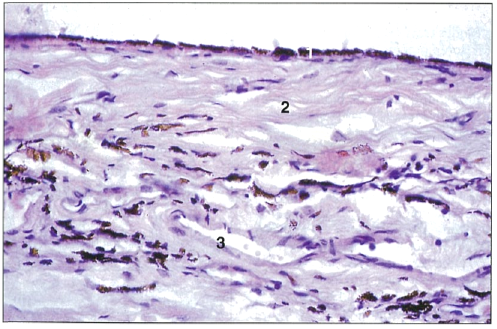 Source: Aughey E. and Frye E.L. (2001) Comparative veterinary histology, 1st edn., London: Manson Publishing Ltd. Figure 17: Nictitating membrane (third eyelid) of a canine. 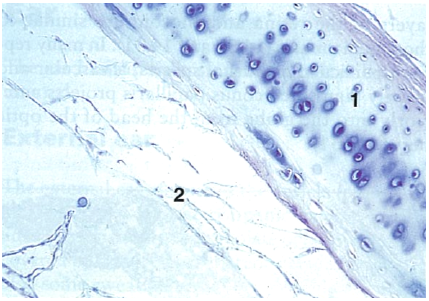 1: Hyaline cartilage 2: Seromucus-secreting glands in the lamina propria. H&E. 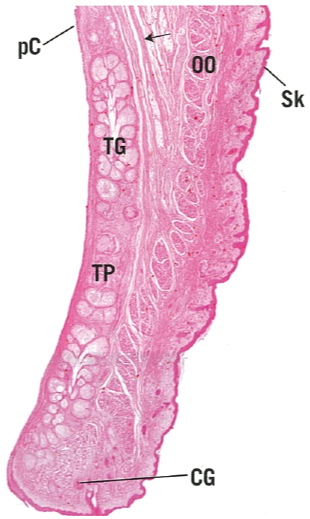 x50 Source: Aughey E. and Frye E.L. (2001) Comparative veterinary histology, 1st edn., London: Manson Publishing Ltd.
Gartner L.P. and Hiatt J.L. (2009) Color atlas of histology, 5th edn., Philadelphia: Lippincott William & Wilkins. Young B. and Deaken P.J. 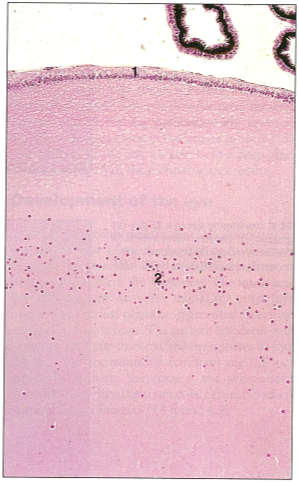 (2002) Wheater's functional histology: A text and colour atlas, 5th edn., Edinburgh: Churchill Livingstone Elsevier .